Not sure what to order? Try the Griddle Breakfast. At Maggie’s, our breakfast and lunch menus offer a wide range of meal selections. If you aren’t sure what you want, the Griddle Breakfast is an excellent choice any time of day – you can have a little bit of everything! The Griddle Breakfast comes with one egg (prepared your way), choice of meat and two fluffy buttermilk pancakes, two slices of French Toast or a waffle. 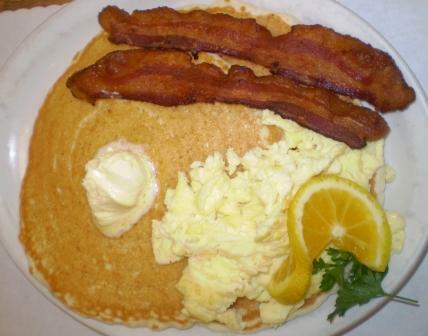 Here’s a peek at one Griddle Breakfast with bacon. Delicious! This entry was posted on Wednesday, September 16th, 2009 at 3:12 AM and is filed under Breakfast. Tagged: bacon, egg, french toast, griddle breakfast, pancakes, waffle. You can feed this entry. You can leave a response, or trackback from your own site.